A question I hear frequently is “What is the best probiotic out there?” The person asking is always referring to a pill. But is a pill really the best option? Aside from costing a small fortune every month, especially for a family of 6, are pills any better than eating a good fermented food? How many LAB’s in a pill is easy to find, just look on the label. But it’s difficult to find good information on exactly how many LAB’s are in a fermented food since it’s such a subjective topic. What vegetable are we talking about, how fresh was it when it was fermented, was a starter culture used, what was the temp, was an anaerobic vessel used? I’d love to send my ferments in to see how they stack up but the costs behind that are prohibitive for just a curious blogger. I’ve seen numbers as low as 1-1.5 billion per 25 gms (.9 oz) serving of sauerkraut  to vegetables started with a probiotic starter culture having 10 trillion . Trillion. Yup, I said trillion. Dr. Mercola had some of his fermented veggies tested and the results were astounding. Pills on the other hand typically contain between 50 million-10 billion bacteria units per pill. 10 trillion would be more than a whole bottle of probiotic pills. Fermented vegetables contain soil based bacteria not found in cultured dairy products so mixing things up is always good. Eat yogurt for breakfast, have sauerkraut with lunch and drink kombucha with dinner. Just an example of some of the bacteria involved in fermenting vegetables include (from The Liberated Kitchen). Does bacteria make it through the stomach to the intestines anyway? This is one argument I’ve heard in favor of a pill. They claim the pill’s casing should make it to the intestine protecting the bacteria through the stomach. But is that really necessary. Lactic acid bacteria thrive in acidic environments. Also when eaten with a food or in a beverage, the food or liquid itself protects the LAB’s considerably. While not each and every little bit of bacteria make it to the intestines, most do just fine. So my conclusion? Save your money and get fermenting. Not only is it cheaper but you get more probiotics and more nutrition. If you are unsure where to start, I highly suggest purchasing Lisa Herndon’s book “Lisa’s Counter Culture” or for some great in depth instruction, check out this lactofermentation e-course from KerryAnn of www.cookingtf.com with many videos and more videos added frequently. I’m not sure if Dr. Mercola uses an anaerobic system for his ferments but we do know that a good anaerobic envirnoment is better for lactic acid bacteria and should create more of these wonderful buggies. Kind of makes me excited about how awesome my ferments probably are. 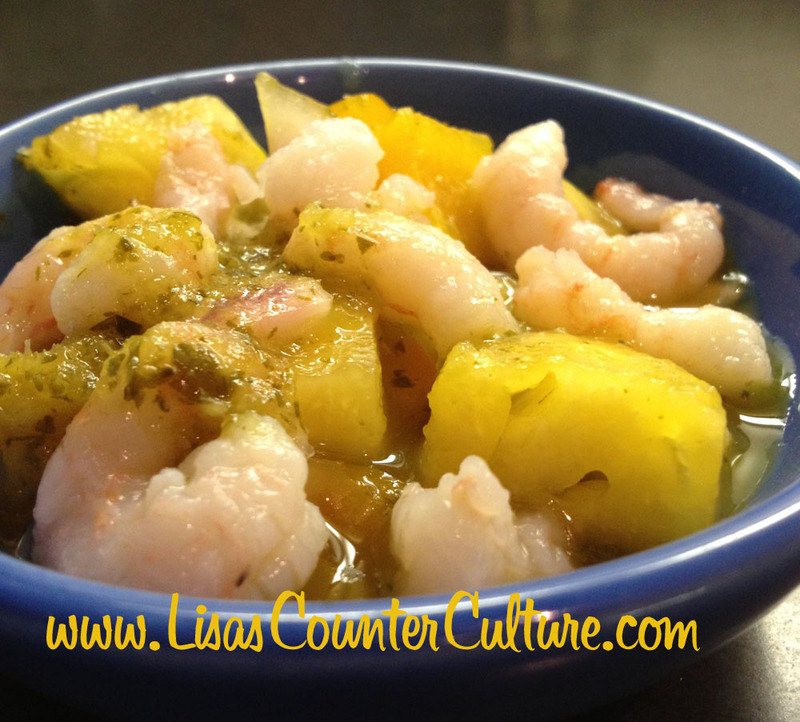 This recipe for Pineapple Chutney from Lisa of Lisa’s Counter Culture looks amazing! I bet it would taste great on pork chops. Ooh, now I’m salivating. Pretend you are in Hawaii Pineapple Chutney. Patty from Loving Our Guts shares how she makes sauerkraut: Crispy Crunchy Sauerkraut. This is how I make my sauerkraut now. She is also doing this interesting yogurt experiment: The Great Yogurt Experiment. I’ve noticed when I do my milk kefir in a fido without an airlock, it has a less than desirable taste similar to what Patty experiences with yogurt. And Lydia from Divine Health From the Inside Out has a recipe for Kefir Fruit Leather. I think this would be an awesome way to get some probiotic goodness in some of my more ferment resistant kids. She is also launching an online course that sounds amazing! Why is Your Gut Making You Sick and What To Do About It? It runs from November 7th through December 12th. You’ll not want to miss this! What are anaerobic vessels? I am in UK and just make water kefir at the moment in Kilner Jars. I have had two bottles of kefir explode during second fermentation so my husband is getting rather nervous. I love getting the fizz though. I use ikea flip top bottles for that. I am keen to start fermenting veg but not sure what I should be using. Hi Michele! I use Pickl-it jars myself and find them to be the best by far. I know shipping to the UK is spendy so they do sell just the lid kits overseas. The lids are interchangeable with Fido jars that I believe you should be able to find over there. I understand your husband’s hesitation with the second ferment. I’ve had my fair share of bottles explode (and the multi-colored ceiling to prove it). I try to keep mine in a cardboard box or cupboard to contain any explosions now. Thanks for your reply . I will see if I can get them here and if not will just get the lids. Thank you, Amy! Nice to meet you too. Mercola’s fermented vegetables are an outgrowth of the work of Caroline Barringer and Jennifer Petcot at http://www.Immunitrition.com. That 10 trillion CFU count came from Caroline and Jennifer’s ferments. Can I use a probiotic capsule, containing multiple strains of bacteria as a veg/kefir starter? Your site is extremely helpful to us. We are producers of raw fermented krauts and other foods, but were not aware of the necessity of fermenting the kraut for 4 weeks instead of 2. We plan to go forward with the longer ferment. However, I am seeing an opposite view on the benefits of the probiotics in kraut versus probiotic pills. I have seen in at least one site that many of the pills do NOT survive the small intestine and subsequently do not populate the large intestine. One reference can be found at http://bodyecology.com/articles/probiotic_foods_vs_supplements.php#.Ursz-rSUewI from the Body Ecology site. And the naturally fermented foods DO survive the small intestine and are present in the large intestine. I would be interested if you have any further insight on this. can I open a capsule of probiotics and add it to fermenting veggies? Bump – interested in same question. A few weeks ago I pickled Jerusalem Artichokes because they contain, inulin a prebiotic. My idea was to combine probiotic and prebiotic in the same food. Just sliced as thin as I could with salt and a little water. It’s a wonderful and also beneficial little bit of info. Now i’m fulfilled that you simply distributed this convenient information around. Make sure you continue being us all up-to-date like that. Appreciation for expressing. Your citation for 10 Trillion CFU led me to mercola.com where it is just simply stated 10 trillion CFU. No citations, no studies, the studies don’t exist, I’ve spent 2 hours now specifically looking for them. Besides this, which cultures? Alive or dead? Most likely dead, considering CFUS peak during the fermenting process, and rapidly drop towards the end. This isn’t some homebrew revelation you’ve had, if saurkraut were this effective they would be testing it on lab animals rather than live probiotics, why would they waste money if they could give a mouse basically a thimble of saurkraut and repopulate his microbiome a thousand times over? This is totally ridiculous I can’t believe you guys think this is real. Easy solution here, give one group a 150 billion count probiotic, give the other group whatever you guys figure, 1 tablespoon should be about 10,000x the amount of saurkraut, and check faecal elimination afterwards like they do with all probiotic tests. End of story you’ll see little to no change from saurkraut and a drastic change in the probiotic. Give me a study that shows Saurkraut contains 10 trillion CFUs or accept this is a delusional.